"Mary Constance" - my first love. 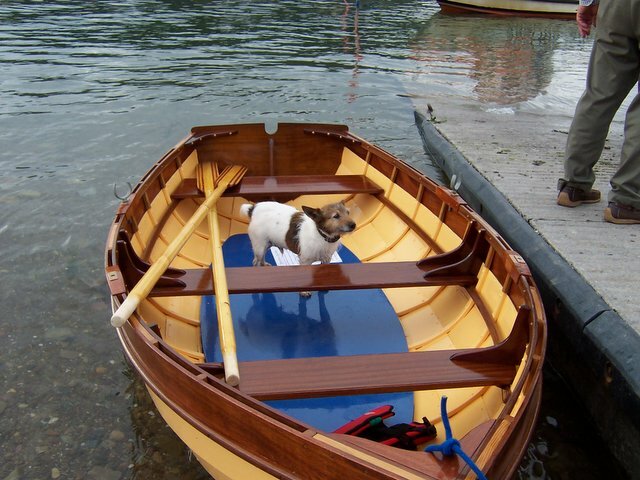 Launch day - Scamp can't be kept out of a boat - the oars are unfinished - see HERE for more on oars. Anne built this over 3 years from recycled cedar taken from a PortaKabin type building being demolished at St John's Central College, Cork. (If you know of any similar buildings or indeed any decent timber in buildings being demolished that could be used for boatbuilding please let me know). It is a 3/4 scale version of a New York Bay catboat or Bagger - was featured in Water Craft magazine issue 55 Jan/Feb 2006 - contact me if you want more info. In the background is John Geary's Angling Charters boat (plug plug!). John Geary (Senior) teaches boatbuilding at St John's.